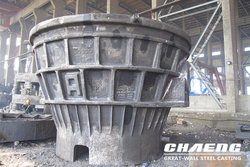 CHAENG (Xinxiang Great Wall Steel Casting Co., Ltd) has over ten years' experience in manufacturing slag pots according to customers' drawings. Before casting, numerically simulate the casting process by CAE software to analyze the molding process, predict and optimize the product quality. Perform the spectral analysis on the sample of hot metal. After qualified, start pouring according to the principle of "low temperature and quick casting", and the pouring time and temperature shall be recorded. CHAENG uses advanced detection equipment for non-destructive testing to ensure the internal quality of slag pot. CHAENG steel castings can meet level-two flaw detection standards.